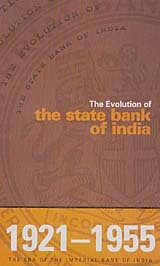 The Evolution of the State Bank of India. Sage Publications. Pages 674. Rs 1,100. THIS book is the third volume of history of the State Bank of India. It covers the Imperial Bank era which lasted from 1921-1955. Two volumes, covering the period form 1876-1920, on Presidency Banks were published in the eighties. Incidentally, the Imperial Bank era was a crucial phase in Indian history. It was marked by nationalist upsurge, great market depression, separation of Burma, formation of the Reserve Bank of India, evolution of banking, World War II, Independence, Partition and above all, a free nation with high expectations from the banking system. All these events have been suitably taken up in the book. "As Governor of the RBI, I had opposed earlier suggestions to nationalise the Imperial Bank on the ground that against the economic environment as it then was, such a measure was premature. In making my views felt I had drawn support from Sardar Vallabhbhai Patel. Early during my tenure as Finance Minister I had treated with scant regard similar suggestion from my colleague T.T. Krishnamchari". Yet it was the same man who four years later made the historical announcement of nationalisation of the Imperial Bank. Notably, the demand for lending to the agricultural sector by banks is not of recent origin. Rather some 70 years back, Sardar Buta Singh from Punjab had taken up this issue in the Council of States in 1933 to empower the Imperial Bank for lending to agriculture estates. The precarious position of Imperial Bank's branches in West Pakistan during Partition when all their Hindu staff had migrated to India and the Muslim staff was not immediately available and how the situation was dealt with is an interesting study piece for bankers. Though the author is at his narrative best in giving the brief account of Indian politics till the mid 1930, it looks alien to the main account of history of a bank to go in for purely political events which form a good portion of the book. In a chapter, aftermath of Partition, legacy of the Raj, devaluation of rupee, free India's endeavour to boost exports from the country, the Banking Companies Act, 1949, have been discussed. The Act assumes significance because as many as 647 banks had failed between 1939 and 1949. Though the book can be useful to the students of economics and history, the team of authors, who appear to be on the staff of the bank, obviously forgot Johan Betjeman who said, "History must not be written with bias and both sides must be given even if there is only one side."